Two days before Jericho’s birthday a tiny baby bunny appeared outside my back door, which is sliding glass leading into a small, but high-fenced backyard. I see the babies often enough in little groups around the complex, tiny ones don’t generally wander too far from the nest until they’re about the size of a large softball and then start to explore more readily. This one was the smallest I’d ever seen. Initially it seemed like he was eating something, so I watched him, but after a few minutes it was clear something was off. He was just sitting there on the cement, inches outside my door, occasionally swaying like he was falling asleep on his feet. He didn’t really seem to be eating, or doing anything, and even after more than 30 minutes he hadn’t moved an inch other than his rather ominous swaying. I approached the back door and clicked open the lock, expecting him to run away as soon as I slid the door open, but to my surprise he merely opened his eyes and looked toward me. I stared at him for a moment, waiting to see if he’d come to his senses, but he never moved. Slowly I approached him, knelt down and reached out a finger to touch him… and did. He was as soft as silk; I’ve never touched anything so soft. He leaned into my hand when I stroked him, and as soon as his eyes closed he fell into my palm as though stricken with exhaustion. I’d never gotten that close to one of the wild rabbits before, most certainly never the extremely skittish babies. I very gently picked him up and cradled him in two hands. I could feel his little heart pounding, though his sleepy eyes betrayed any fear he may have felt. I knew I should leave him, but was afraid he’d freeze in the cold wind, so I took him inside. Just to warm up, I told myself. I held him close to me and within moments he was limp and asleep, his heart slowing, and his body slowly warming up. 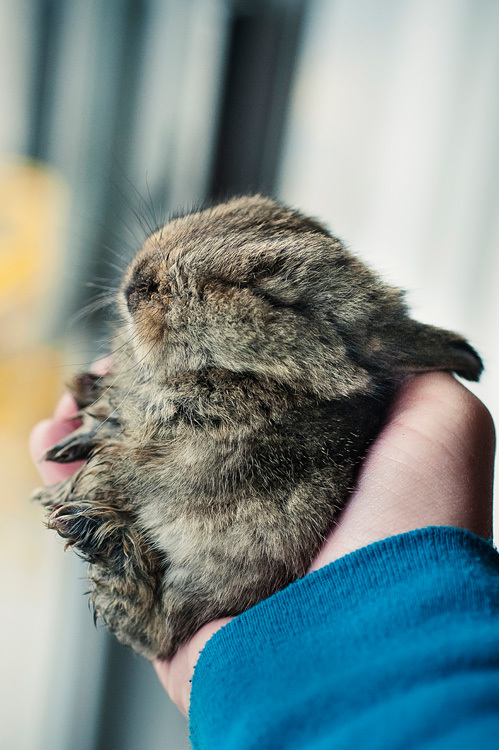 He lay there in my hands unmoving and asleep for an hour. When I tried to put him down, he roused within moments and scrambled out of the box, climbing back into my hand when I presented it and immediately closing his eyes in contentment again. As much as it tugged at me, my heart felt heavy as it occurred to me that me may be sick, or dying. This isn’t normal baby behaviour, by any stretch. I had to go pick up the kids from school, and decided to put him back outside that night after he’d warmed and safely slept. I know that even small babies can be fairly independent, and the mothers return in the evening to feed them. I also know that the neighbour’s cat likes to stalk and kill the tiny babies, and she is put inside at night, so it was doubly safer to wait until the evening particularly if there’s any reason to suspect the little guy is ill. I told myself that if I had any reason to be concerned past that time, I’d call a vet or rescue. He’s no pet, nor do I want another one, but he seemed so strangely helpless laying out there swaying with exhaustion in the breeze and it pains me to imagine doing nothing as he freezes and sways in the yard. When I brought the kids home I made them sit quietly so I could show them what I’d found. I reminded them that he was not a pet, and we’d be putting him back out once he was a little more energetic. I also told them that babies were fragile, and there was a strong possibility that he was sick due to the way he’d been acting when I found him. They nodded dutifully, and each asked for a chance to touch him. Xan gently ran a finger between his little ears, and he closed his eyes in contentment, his heart slowing. I almost expected him to purr. When I had to cook and clean, Tempest took over the cuddling, since he didn’t seem to like being put down. He seemed to panic when not held or stroked. Shortly after we arrived home my neighbour, J, came by and asked me if I’d seen a tiny baby in my yard. I explained to her what I saw, and sheepishly admitted that I’d taken him in. She thanked me profusely, and told me she was terribly worried that he wasn’t healthy. She’d seen him the night before on the edge of my yard and hers, shivering and unmoving, and had taken him in after calling her friend who is a vet. Her friend told her to put him back out early in the morning, in hopes it would prevent him from freezing to death overnight. She had… and he had not moved since. It had been over 8 hours. She hadn’t seen him eat or drink, and had been watching him out her door in hopes his mother would return, up until she had to leave briefly for work and he’d disappeared (which is when I’d found him). She told me she’d call her friend again and report the changes, and get back to me on what she’d said. While I waited, I continued to give him cuddles either by me, or Tempest. Over the next few hours his lethargy seemed to abate some and his body temperature had improved dramatically. Tempest managed to get him to eat some lettuce and a tiny bite of carrot, and I got him to drink water from my fingertips. I peed him soon after, as I learned to do when fostering baby animals back in my SPCA days, and his urine was a better colour now than it was when I tried to do it originally. Once I’d done that and put him down, he peed on his own and moved around the small box to where the food was. Within another hour, his fur had stopped ‘tenting’ when pulled back and he seemed less lethargic. Relieved, I told Tempest that we’d put him back out that night to find his mom and she was to keep an eye out in the back to see if one came looking for him. Maybe he’d just been separated from his mom long enough to suffer from dehydration and cold, and now that he was better he’d be okay finding his way back on his own. J came by and told me that her friend wanted to check on him that evening before we put him back out; she was still concerned about his initial behaviour. She seemed to think there was a chance he didn’t have a mama or had been separated from her by some distance, given his extreme lethargy and dehydration. In the meantime, J had found another baby next to the house with similar behaviour, called her friend back and took it in. She asked me to wait until she returned with news before putting “mine” back out, as her friend emphasized the risk of it freezing to death if it was ill or orphaned. When she returned she said her friend had been called away in an emergency and the rest of the staff wouldn’t speak to her or give her any information. The only thing they suggested was to syringe it water overnight and bring it to rescue in the morning, but also seemed concerned by the behaviour they showed when we found them and indicated that it was not a good sign that they’d make it regardless of care. While I waited for her to return with news I got a warm cloth and gave the baby a finger bath, peed it again in case it was still having trouble (it wasn’t), and offered it some more water. 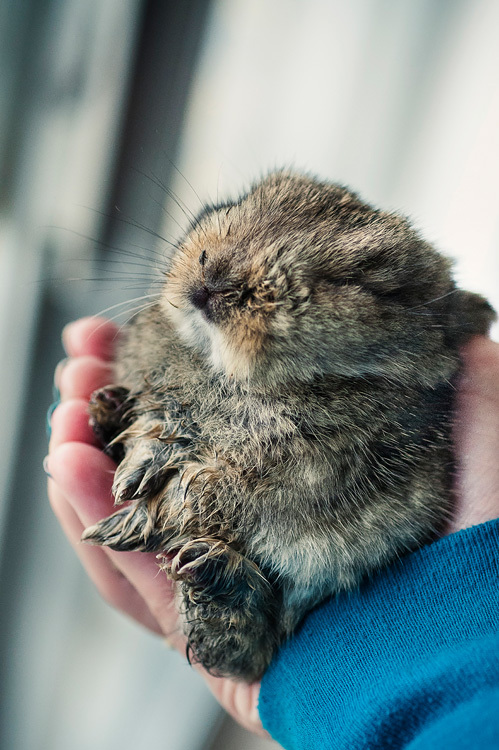 It seemed to greatly enjoy the bath, and fell asleep in my hand so hard that it leaned back with it’s paws out. Shortly after this, having only been in my home a few hours, I saw it stretch in a strange way that I now recognize was a seizure. I didn’t realize that’s what I was seeing until it happened again, and I realized that he may not be as healthy as I’d wished. His brief improvement upon being brought in and warmed up gave me false hope that he’d be okay to release, or surrender to rescue when they requested us to come in the following morning. Within a few more hours, it was clear he was too sick to save. Warming him had only saved him a slow death by freezing, but couldn’t fix the underlying problem. J was over with the littermate when he died in my hands after suffering a long, hard seizure. She wept openly, but I found myself unable to shed my tears. She apologized over and over for being so emotional, embarrassed by her grief in contrast to my stoic facade. Her guilt was heavy, and she reported that the vet had said there was nothing that could be done given it’s behaviour over the last two days and the conditions under which we’d found him. She’d strongly suspected it may have been poisoned or otherwise seriously ill, and the warming had merely delayed the inevitable. At least now he’d died comfortable and fed. The sibling, at least, had continued to improve with warming and syringing and was successfully released early that morning and has been okay since. We walked outside together to watch the sibling bound through the grass near it’s nest, or at least what we suspected was its nest, before curling up in a little pile of hay and falling asleep. J cried and hugged me, caught between apologies and gratitude that I’d found him and at the very least saved him the slow death by freezing; words her vet friend had also given her. 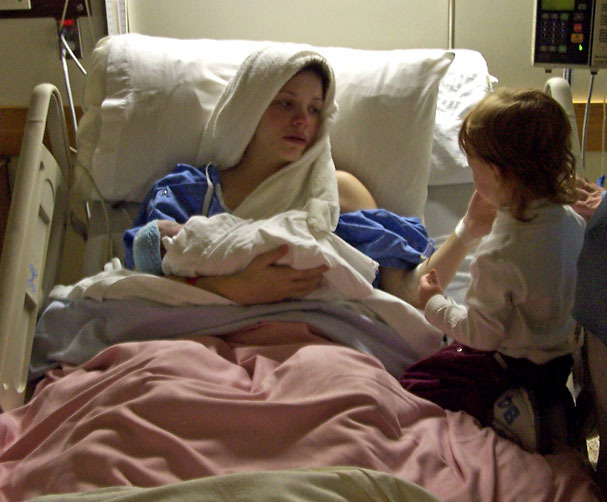 I tried to tell her that the next day was the anniversary of my son’s death, but the words stuck in my throat. I don’t know why I even wanted to say it… I barely know her at all. It took me several tries to get it out, and when it left my lips I heard her gasp and cry harder. I couldn’t look at her face, for fear that I’d join her. Tears stung my eyes, but I knew if I let them come I wouldn’t be able to stop, and this was not a place where I was ready to break down. “Maybe he chose you for a reason,” she said. She immediately chided herself, realizing how terrible it sounded to send death to someone already struck by grief. I didn’t take offence, as strange as it sounded I understood what she meant to express, and I appreciated it. “It’s okay,” I assured her. She went inside a few minutes later to call her husband at work and ask him to come home, too overwhelmed to be alone. I came in and wrapped the little baby in a cotton prefold and put him somewhere safe, waiting until the kids came home to do anything more. It was Hallowe’en day, and as much as I feared it would destroy the evening for them, I couldn’t bury him without them there. 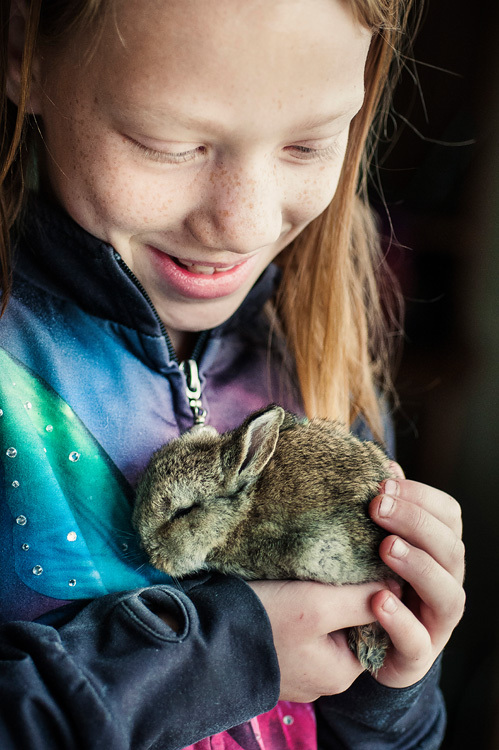 I’d wanted to delay it as long as possible, but they both knew something was wrong when I said I’d talk to them about the bunny when we got home, instead of answering their questions in the car. We all cried together as we went into the backyard to dig a grave. Tempest asked to hold and cuddle him, stroked his fur and held him close, weeping silently and watching her tears fall over his tiny body. Xan was unmoving until I placed him in the grave: he collapsed into sobs as he placed the first handful of dirt inside, watching the grit slip between his fingers and feeling the finality of the gesture. He asked to go inside before we were done in hopes he could escape it. I gave him permission, but he stayed to hear my eulogy nonetheless. When I was done he ran inside and grabbed three baby carrots from the fridge to put atop the mound. “Or maybe for his brother when he visits,” suggested Tempest. Xan nodded, but said nothing. They were subdued for the next few hours, but still eager for the night’s festivities. We continued last-minute work on their costumes, and their moods slowly improved as the evening came on. By the time Curtis got home at 5:15, they were looking forward to going out, and able to temper their grief. Both greeted him with hugs and explained what had happened. 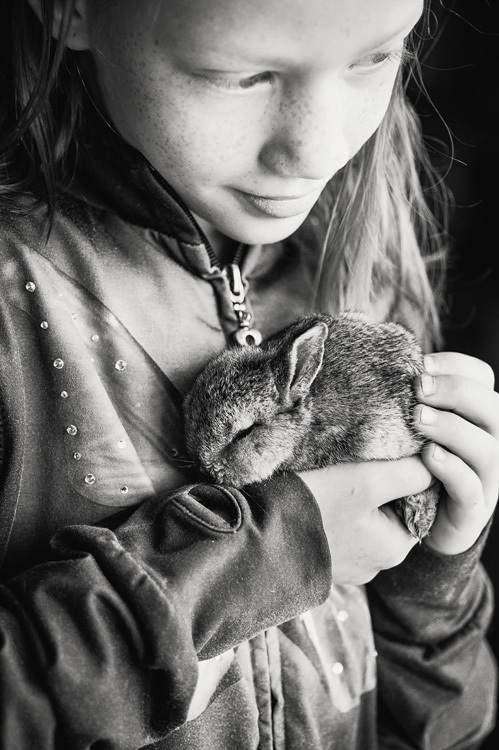 Tempest began to cry again and she hid her face in Curtis’ chest as Xan told him about the grave, the speech and the carrots. “He was so soft,” whispered Tempest, almost too quiet to hear. He’s the third baby I know of that’s died, or been found dead near here recently. At least, it’s the third one I’ve seen dead since moving in. I know the babies have a very high mortality rate and are prone to illness, but it doesn’t make it any less sad. Other neighbours have reported that the number is much higher than three. It makes me wonder if someone isn’t doing it on purpose. In spite of the grief, the night went on without much incident. I was in a pretty extreme amount of pain after the non-stop work from Xan’s birthday party, followed by costume prep and general house cleaning all done on my own, so Curtis took over the first leg of trick-or-treating while I stayed at home and waited for my pain meds to kick in. I went through 3/4 of the candy we’d bought within an hour or so. They weren’t kidding when they said this community was a popular spot. This was Z’s first active Hallowe’en, and she was dressed in a fleecy pumpkin sleeper so she wouldn’t get too cold while she walked around. 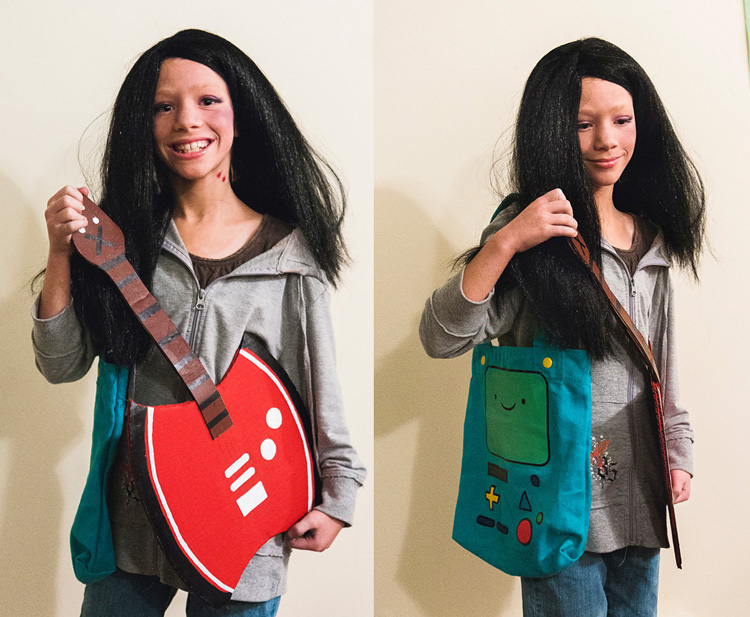 She held out a little Monster’s Inc. candy bag and called, “Treat, treat, treat!” at each doorstep. The Elders ditched Curtis and Z as soon as they were able to sneak away, and showed up back at our door after they’d managed to visit every house in the complex. I texted Curtis to let him know where they were (we knew they’d return when they were done, so it wasn’t a particularly big deal for them to go off on their own within the complex, just mildly annoying that they didn’t ask permission first) and he came back with Zephyra a few minutes later. “She’s done anyway, so I’ll take over the door if they still want to go out,” he reported. Zephyra held up her bag to me, “CAN-KNEE! CAN-KNEE!” she announced, shaking with excitement. I walked through the surrounding neighbourhoods with the Elders for another 40 minutes before we retired home for a late dinner, a few handfuls of sugar and bed. They were particularly excited to hit this one place they call “The mansion” which looks oddly overbuilt for the area with its gargoyles and golden gates. It did not disappoint: they gave out king size bars. Xan was eager to get out of his costume, complaining that it was too constricting to wear for all night. Once he was out of it, Zephyra climbed inside. We’d created it entirely out of cardboard moving boxes, and given the crappy construction I’m actually pretty happy with it. 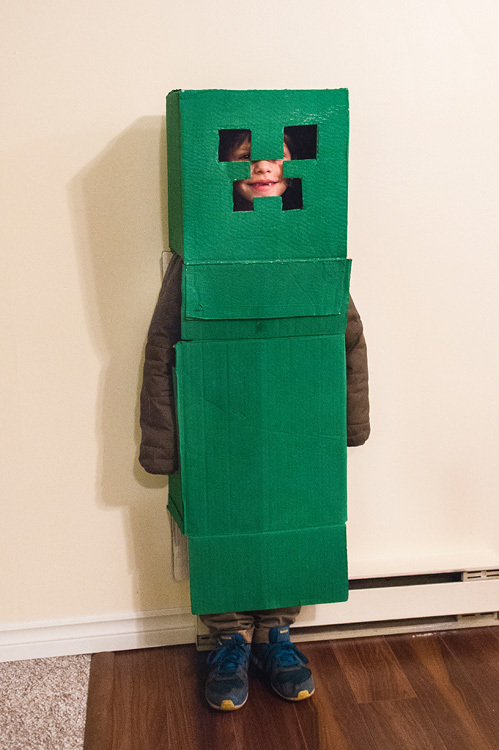 Almost everyone who saw him knew he was a Minecraft ‘creeper’; only one father mistakenly called him Gumby throughout the evening (we passed him near a dozen times before coming to his house after he’d taken his kids home for the night). Tempest’s Marceline costume was recognized about half the time, the rest didn’t seem to know the show, or the character at all. (Not pictured: the red boots). Once she even passed by kids dressed as Finn and Jake, who stopped to pose with her. Another kid dressed as Minecraft’s “Steve” pretended to run screaming from Xan upon sighting him. There were hundreds of kids everywhere, and the candy rush didn’t slow until between 7:30 and 8pm. Curtis ran out of candy by the time I returned, but our stash lasted almost through the end. This is the first year we’ve had a lot of kids and gotten even remotely close to running low. Every other year we generally have most of the bowl left and end up eating it ourselves over the next few days. It’s stupidly fun, and makes me wish we had the money to set up something really fun in our yard next time. Curtis’ weekend started that evening so he didn’t need to put in a special request for the first. We stayed up late playing video games on the couch, long after the kids went to bed. On the morning of the first he did not wake me, and quietly took the baby downstairs with him once she became restless in hopes that I would stay asleep. I was gifted the late morning both to help relieve the pain and exhaustion from the last few days of work, and because Curtis knew I’d need the time to myself. I fell in and out of a dreamless sleep for hours before finally giving up around 11:30 when Curtis opened up the door to let Z in for a nurse. She approached the bed with both a whine and smile, and I lifted the blankets to let her in. She climbed in eagerly, inching next to me and curling her body up against my stomach before pawing into my nightclothes in search of a breast. She gave a quiet, happy coo as she drank and stroked my chest lovingly. Curtis slid into the bed next to her and cuddled in close so she’d be secured between us. When he drew an arm over us, it was long enough to pull us both in for a tight hug. Within moments he was sound asleep, and Z’s heavy lids told me she’d soon follow. I watched as her eyelids stopped fluttering, and felt her hand let go of mine as she surrendered to exhaustion, the tension slowly leaving her body and her breath slowing. She so rarely naps without a fight these days, and it has become a very rare thing to watch her fall asleep peacefully. Suddenly, I was crying. I don’t even know why it struck me then; the tears came on without warning and once I lost the fight to hold them back they came like rivers. I felt guilty that I had not cried for him in some time, and the agony of that guilt and grief is strangely comforting. And I was desperate for anything to fill the void I was feeling that morning. I remembered the words of my therapist some years ago, when she reminded me that pain is not the only way to keep his memory alive. “I don’t ever want it to stop hurting,” I’d told her. When Zephyra’s breath was slow and even, I slipped out from under her arm and rolled out of bed. I walked over to the sliding glass door next to our bed, and watched as the yard below me came into view. I rested my forehead against the glass and looked down upon the grave we’d dug for the bunny the afternoon before. One of the carrots was gone, and another had fallen to the side. My tears continued to fall; even so many years on it’s easier to cry for another than for my own. I rounded the bed and headed for the bathroom to clean my face, but was stopped by Curtis’ hand. I don’t know that he saw me crying, but he’d awakened as I walked past him. He pulled me down for a kiss, and told me he’d make a special dinner that night. I smiled, but I didn’t mean it. As much as I appreciate his gestures, it’s hard for the warmth to reach me. I spent most of the day wishing I could go back to sleep. I always think the next year will be easier on me – next year I’ll be more prepared and able to face the day without feeling like I have a weight tied to my legs – and every year the day comes and it’s never as I’d hoped. Some of the recent years have left me unable to build up the energy to want a cake to celebrate him with the kids, or even leave my house and interact with people, for any reason. It took every ounce of strength in me to join Curtis and the kids on a walk to the library much later in the day, and the only reason I went is because I knew the fresh air might help me feel less ill.
We didn’t do anything for him all day. No cakes, no eulogies and no conversations with the kids. My mom picked the Elders up from school and took them back to her house for a visit until late afternoon; she even fed them dinner so we wouldn’t have to worry about it, and gave them a few small toys to keep them entertained. Curtis and I spent the time playing games or laying atop each other on the couch in silence while the baby took an extra long nap upstairs. But no matter what I tried to fill my head with, nothing could remove me far enough to stop the sting. I fell in and out of sleep on the couch, and when I finally woke Curtis had gone upstairs to take a shower with the baby after she’d awakened. We waited until after the kids were in bed to start our dinner, and Curtis’ promise didn’t disappoint: he made me eggs with maple bacon, sizzled ham and home-made hash browns all piled together with a blend of spices and sauce that made it burn my lips when I ate it. It’s a weird sort of comfort food for me, and I was grateful for it. We sat in silence again as the clock turned to 10:47, and I cried some more. He held me, and we fell asleep in each other’s arms. For years before him, we slept as far apart as two people could while sharing the same bed. I couldn’t stand to touch his skin at night: too hot and too claustrophobic. I even put pillows between us to avoid him. The first night I was home after he died, we fell asleep holding each other and crying. We never slept apart again, and still drift off every night in each other’s arms. Now I can’t sleep at all without his arms around me and his body warming me. Every night for eight years, save for the ones I was traveling… and they were awful without Curtis’ heat next to me. Eight years gone and almost a decade without him. I think every day how much better everything would seem with another little boy in the house. I know I’m romanticizing it; the idea of his life and a future I’ll never know. I’m not naive: parenting is never all flowers and rainbows and I know he and Xan would probably fight just as much as Xan and Tempest do… but it’s hard not to wonder, and wish to have seen, how much different it could have been if he’d stayed.